Since starting at the advertising agency, my first “real-world” job, I’ve come to a realization: Thank god I cook. Not only are my lunches better than whatever Lean Cuisine just exploded in the microwave, it also gives my coworkers and I something to talk about. I don’t have a child. I have no idea what closing on a house is like. I can’t complain about in-laws coming to visit, but I can share a good slow cooker recipe. Until you get to know people better, food is a great way to bond. This recipe was passed along by my mom’s coworker. I probably would have overlooked it without a recommendation. I love spinach in my salads but to be honest, I rarely cook with it (minus a stir-fry here and there). I was amazed to find I loved its consistency in the soup. To me, good soup has enough ingredients to keep every bite delicious but if I happen to get a spoonful of just liquid, I should be just as happy. This soup passed that test. I loved the gnocchi. It made the dish more hearty. The cream gave it that rich taste but didn’t overpower the vegetables. Next time I’m in the lunch room, I think I’ll pass this on. Bring water to boil in medium pot for chicken while you prepare and chop the vegetables. Once boiling, add the chicken breasts and cook 15 to 20 minutes until fully cooked. Cube chicken. Heat olive oil in large, dutch oven over medium heat. Cook onion, celery, and carrots in the hot oil until onion is translucent, about 5 minutes. Add garlic and cook for 30 seconds or until fragrant. Stir in cubed chicken and chicken broth. Bring to simmer. 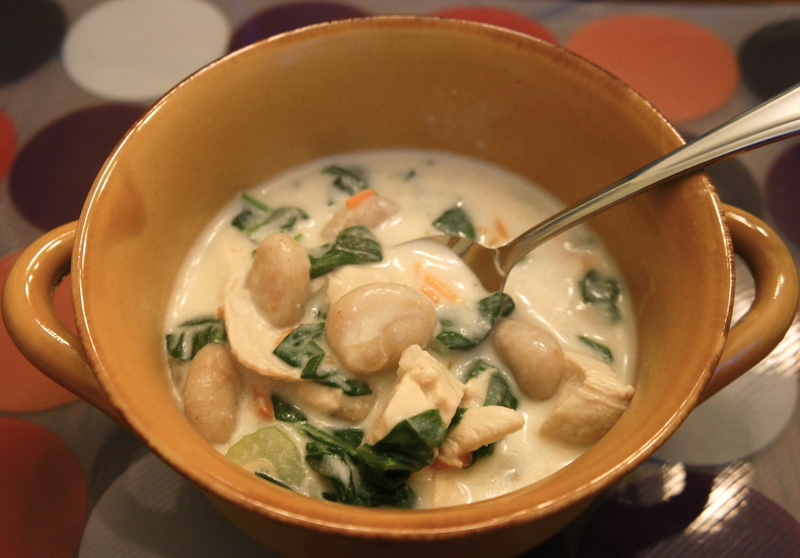 Stir gnocchi into the simmering soup and cook until they begin to float, 3 to 4 minutes. Stir in spinach; cook until wilted, about 3 additional minutes. Whisk cornstarch into cold water until smooth. Stir cornstarch mixture into simmering soup. Stir until soup begins to thicken. 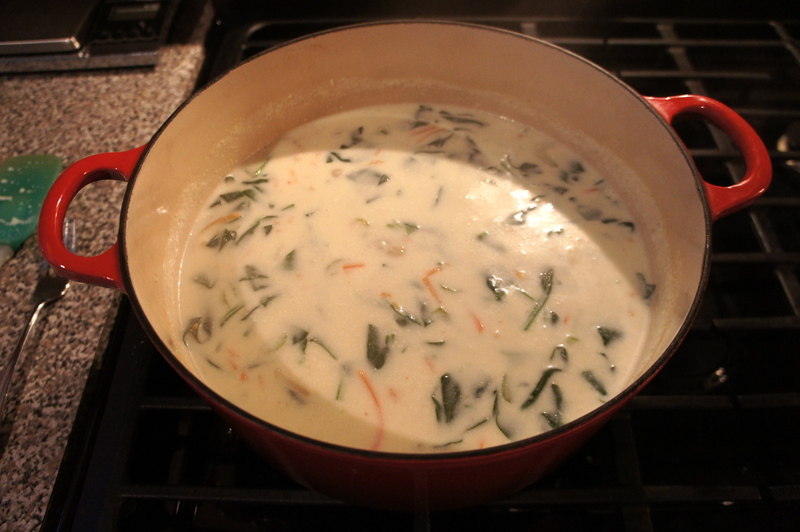 Add half and half and continue to cook while soup thickens, about 5 minutes. Season with salt and pepper to taste. Well, I’m going to try and get through my first post-marathon run. I don’t feel sore anymore but… Here’s hoping that lasts.